Her Novel is available on Amazon.com and as a Kindle download, click here to go to the Kindle Store. 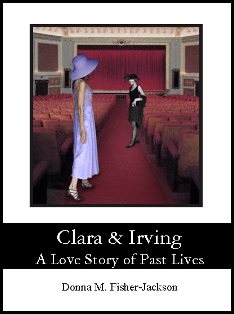 Clara and Irving’s love story begins in the Roaring 20’s in the seacoast village of Onset on Cape Cod Massachusetts. They meet and marry in this golden age of vaudeville theatre, silent films, casinos and dance halls. Their love story revolves around the Zeiterion Theatre, a 1920’s vaudeville theatre which becomes the stage for their love affair in years to come. Told through the eyes of Clara, and her granddaughter, Danielle, the novel unveils the lives of the two women, and the men that capture their hearts across time. From the 1920’s to the present time of 2010, their two stories are interwoven revealing the intimate connection between Clara and Danielle who both share a love of the theatre, and the love of a soulmate. As the author of the non-fiction book, The Healing Path of the Romantic: Type Four of the Enneagram Personality Type System, Donna has brought to life the personality of the Romantic in her current novel of Clara and Irving. Based on the true story of a Romantic, Donna takes you on a journey through the world of past lives, and how the seeds of a Romantic can be planted in lifetimes ago. It’s a love story that may prompt you to go on your own quest to uncover your own past lives and your soulmates across time. If there is one truth in life, it’s that love lives on forever. If you would like to hear Donna talk briefly about the story behind her book, please watch this short video on YouTube. You can also watch Donna reading an exerpt from Chapter 50 on YouTube. To read an excerpt from her book, please click here to open a pdf document with Chapter One and a partial Chapter Three. Constance S. Rodriguez PhD, Author of “Gifts of the Soul: Experience the Mystical in Everyday Life” Llewellyn, 2007. 5 out of 5 stars Couldn’t put it down! A terrific read! I loved the characters and how the story intertwined. I have done past life regressions in the past and have enjoyed learning of my own “threads” and souls that have been with me lifetime after lifetime. You won’t regret buying this book!!! 5 out of 5 stars Read this book for a tale of quaint journeys of love on the Cape. A love story entwined in both the roaring 20’s and the trendy 1990’s. Take a journey with Clara and Irving down the quaint, “cobbled” streets of Onset and into New Bedford, Massachusetts with Danielle. Their paths continue to criss cross in different eras on their quests to find soulmates and fulfilled passion. A charming read for all, especially romantics. Donna Fisher-Jackson’s tale of interwoven love relationships from different eras melts away as you read it, highlighting the equal joys and sorrows of self-sacrifice in balance with self-awareness in the main character. Her spunky and by turns nostalgic take on the vaudeville era in conjunction with the seemingly hapless nineties makes for fun reading, and highlights this New England area in a unique way. The climactic and dramatic turn in the end puts into perspective all that makes love both a gift and a risk well-taken, and will change your own notions of what romance can be. By Chatham H. Forbes Sr. There is an authenticity to this book that derives from the author’s family connection to the principals. Readers who are current on modern survival theories will be accepting of the reincarnation theme, and intrigued by its powerful influence on a New England family over generations. A moving story.